A CLINICAL STUDY OF EXTENDED-RELEASE NALTREXONE (XR-NTX) VS ORAL BUPRENORPHINE-NALOXONE (BUP-NX) IN OPIOID DEPENDENCE CONFIRMED NONINFERIORITY OF XR-NTX VS BUP-NX. A 12-week, multicenter, outpatient, open-label, randomized clinical trial of opioid dependent (DSM-IV criteria) patients, age 18-60 years, in Norway. 73 individuals were excluded due to: refusal to participate (51), not meeting inclusion criteria (9), failing detoxiﬁcation (6), or other reasons (7). Retention in the XR-NTX group was noninferior to the BUP-NX group at the conclusion of the 12-week study. 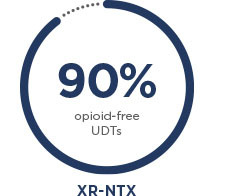 The total number of opioid-negative UDTs was noninferior when comparing XR-NTX to BUP-NX. The study was not blinded. Participants of each treatment group knew which medication they were receiving during trial. 232 adult opioid-dependent individuals were recruited from outpatient addiction clinics and detoxification units. 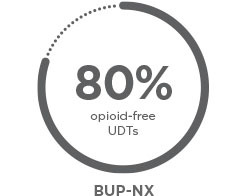 After screening and inclusion, participants were referred to a detoxification unit, and randomized to treatment after detoxification.159 participants were randomized to either receive daily oral flexible dose BUP-NX, 4 to 24 mg/d (n=79), or XR-NTX, 380 mg, administered intramuscularly every fourth week (n=80). Participants were given weekly urine drug tests (UDTs). The weekly UDTs were calculated as the number of opioid-negative urine drug screens divided by the total number of attended tests. Missing UDTs were considered as testing positive for opioids in all participants. Participants were asked to attend standard drug counseling, but no behavioral interventions could be initiated. Exclusion criteria included women who were pregnant or breastfeeding, or had other drug or alcohol dependence, or serious somatic or psychiatric illness that interfered with study participation. Data are mean (SD) or number (%). Request a visit from a VIVITROL representative for additional product information, resources for your patients and more. Tanum L, Solli KK, Latif ZE, et al. Effectiveness of injectable extended-release naltrexone vs daily buprenorphine-naloxone for opioid dependence: a randomized clinical non-inferiority trial. JAMA Psychiatry. 2017;74(12):1197-1205.